One of the key features of Unison is that your members can register themselves to join your groups! Text-to-join is a way for members to join groups and get connected with your organization by sending a text from their phone. By providing them with a dedicated number for your organization and keyword for the group they want to join, individuals can send a quick message to immediately start receiving new posts. Registration links allow you to not only ask a member to join your group, but also optionally have them fill out a customized form to gather additional information you need when they join the group. 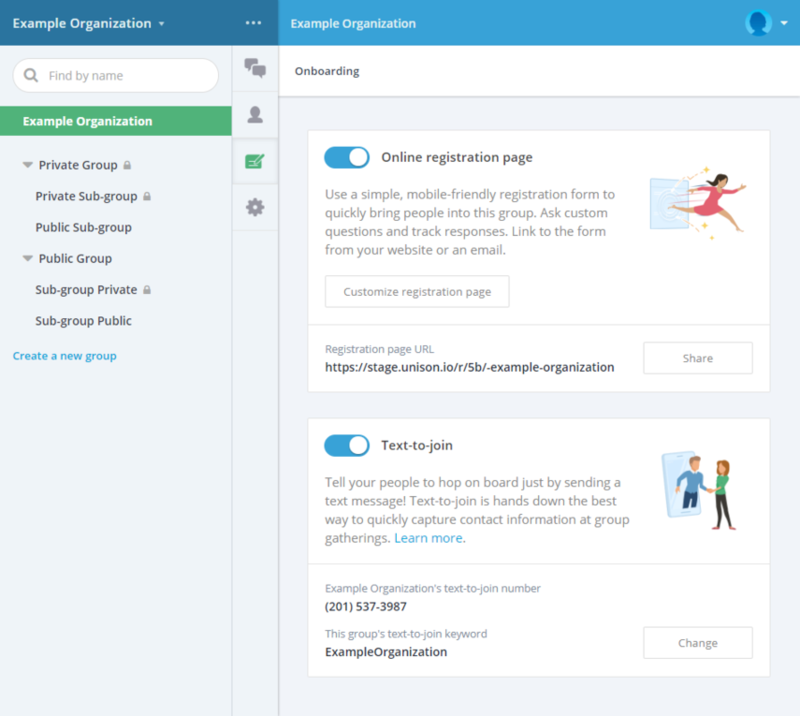 When logged in as an admin or leader of an organization, you can set up text-to-join or a registration page for any one of your groups or subgroups. Click on the name of the group on the left. Click the Onboarding icon to the right of the groups browser. To set up a registration page, toggle the button in the top section of the page to the on position. The registration page can then be customized. When done, the registration URL can then be shared with others via social media, email, or embedding a button on your website. To set up text-to-join, toggle the button in the bottom portion of the page to the on position. A pop-up will ask you to set a text-to-join keyword. Click OK once you have a keyword you like. And just like always, if a member joins a sub-group, they will automatically be added to any parent groups in the organization, as well, with no additional steps.